On Friday Oct 12 a low pressure area over the eastern Caribbean sea formed into Tropical Storm Rafael. At this point Storm warnings were issued for the U.S. Virgin Islands and the British Virgin Islands of Anguilla, Barbuda, St. Kitts, Nevis, Antigua and Montserrat. 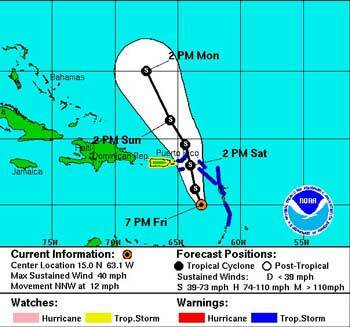 Tropical Storm warnings were also issued for some of the Curacao islands, Saba, St. Eustatius and St. Maartin. France issued a warning for St. Martin, Guadeloupe, Desirade, Las Saintes, Marie Galante and Martinique and there were also Storm Warnings for Puerto Rico, Culebra and Vieques. Tropical Storm Rafael became a hurricane on Monday Oct 15 as reported by the National Hurricane Centers 6:45pm ast report. The maximum sustained winds were at 75 mph while the hurricane traveled in a Northern direction at 10 mph on it’s way to Bermuda about 560 miles north. 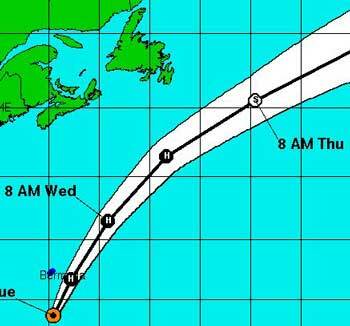 Rains started affecting Bermuda in the early afternoon of Tues Oct 16 and had passed Bermuda by 11pm ast on Oct 16 at which time Bermuda discontinued its tropical storm warnings. The winds reached up to 85mph (category one on the Saffir-Simpson hurricane wind scale) while passing over the island dropping 2-4 inches of rain in some areas. During this time the hurricane force winds were reaching out about 35 miles while the storm moved North-Northeast at 26mph. By 8pm ast the storm had slowed its forward movement to about 10mph while continuing to strengthen as it headed northward. Fafael turned into a extratropical cyclone (definition) by the Oct 17 2012 5pm ast advisory and was heading into the open atlantic with 75 mph winds at a Northeast direction at 35mph. At this point the only hazzard affecting land were remnants of the surf and swells that are expected to continue for the next day or so.